I have always loved stories. As a child I read as much as possible – on car trips, at the beach, late at night. I didn't like going anywhere without a book, something that has never changed! I grew up in a house filled with books and I read all of them, but my favourites always had an element of fantasy. Oz, Narnia and Middle Earth were places I visited many times. When I had children of my own and reading stories led into writing stories, it was almost inevitable that magic would creep into my own writing. All three Chitten Adventures, Milly and the Chittens, Chittens in Trouble and Chittens to the Rescue are now available as both print books and ebooks. 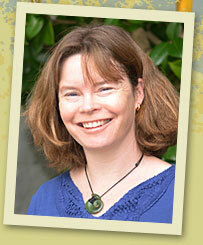 I live in Auckland, New Zealand with my husband, three children and an excitable Irish terrier called Finn. When I'm not writing, I volunteer as a guide on Tiri Tiri Matangi Island, a sanctuary for native New Zealand birds. And read lots of books!